1. Preheat oven to 350 degrees. Line a baking sheet with foil or parchment paper and set aside. 2. To make bread crumbs: Toast bread. Break up bread and add to a blender or food processor. Process until the bread turns into crumbs. Measure ½ cup crumbs. 3. In a large bowl, add ground beef, bread crumbs, ⅔ cup pizza sauce, onions, zucchini, ricotta cheese, egg whites, Italian seasonings, garlic powder, salt and pepper, to taste. Using your hands, mix together all the ingredients. Blend well. 5. 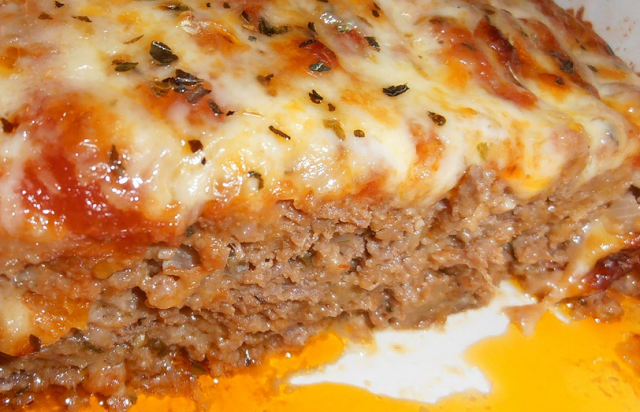 Spread ½ cup pizza sauce all over the top of the meatloaf and down the sides. 6. Bake for 45 minutes. Remove from oven and spread with remaining ⅓ cup pizza sauce on the top of the meatloaf. Sprinkle the top with shredded cheese. Place back in oven for 10 minutes.